comedy | I write a lot! Blog from those who write a lot. In the final scene of Alvin and the Chipmunks: The Squeakquel, Alvin and his two brothers bed down for the night just a few feet away from three singing female chipmunks. Chipmunks are not exactly known for their restraint, which leads us to some depressing math. Your guide to the news and the nonsense of awards season. Join the discussion. The Eastern chipmunk can produce two litters a year, with up to five young each. Thus within a decade, since cartoon chipmunks never die, there will be thousands of talking, singing chipmunks running around the animation universe, far more than the ecosystem can tolerate. They will begin showing up everywhere: stampeding through The Simpsons, mucking up Japanese anime, driving Clifford the Big Red Dog bonkers. Earplug sales will soar as they sing their electronically manipulated heads off. 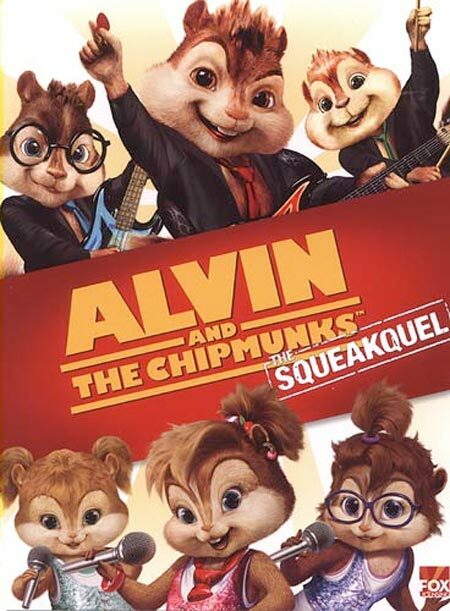 Anyway, the latest adventures of Alvin, Simon and Theodore find them pursuing the rock-star careers they began in the 2007 Alvin film (which, like this one, mixes live action and computer-generated imagery). Their human handler, Dave, ends up in traction within the first minutes of the movie, which somehow results in the boys™ being enrolled in school, which they inexplicably begin at the high school level. Or something like that. Cast: Ricky Gervais, Jennifer Garner, Jonah Hill, Rob Lowe, Louis C.K. MPAA Rating: PG-13 for language including some sexual material and a drug reference. The first half-hour of “The Invention of Lying,” co-directed and co-written by Ricky Gervais and Matthew Robinson, is so sharply fresh, clever and laugh-out-loud hilarious that you can’t help but wonder how they’ll sustain it for another hour. To be honest, they can’t. The early reels are a marvel of sustained comic invention and verbal wit, with a dash of speculative humor that borders on science fiction. Bus ads and building signage offer priceless sight gags (a retirement home bills itself as “a sad place for old hopeless people”), while the movies Mark writes are essentially unvarnished history lessons, read directly to the camera with nary an ounce of Hollywood artifice.